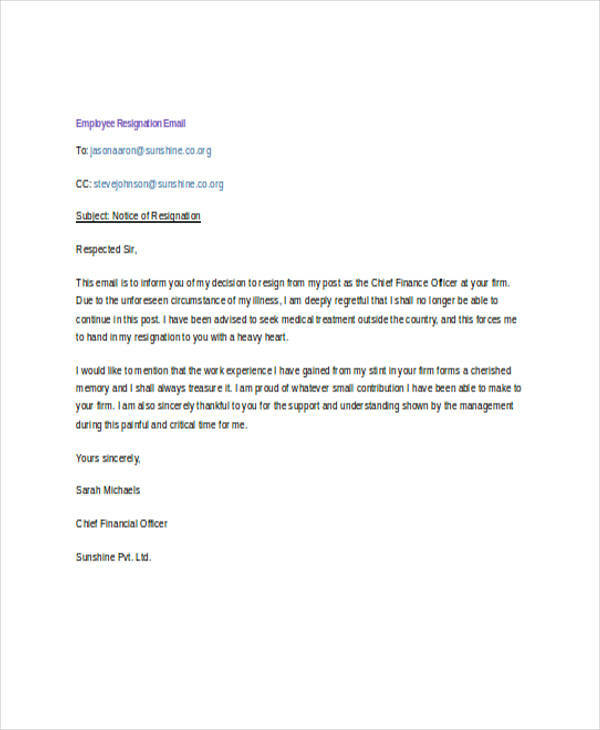 If your are thinking of quitting your job for whatever reason, it is most preferable to get consent from your employer through a one on one conversation. However, certain circumstances are unpredictable and unavoidable thus requiring you to leave the job as soon as possible. 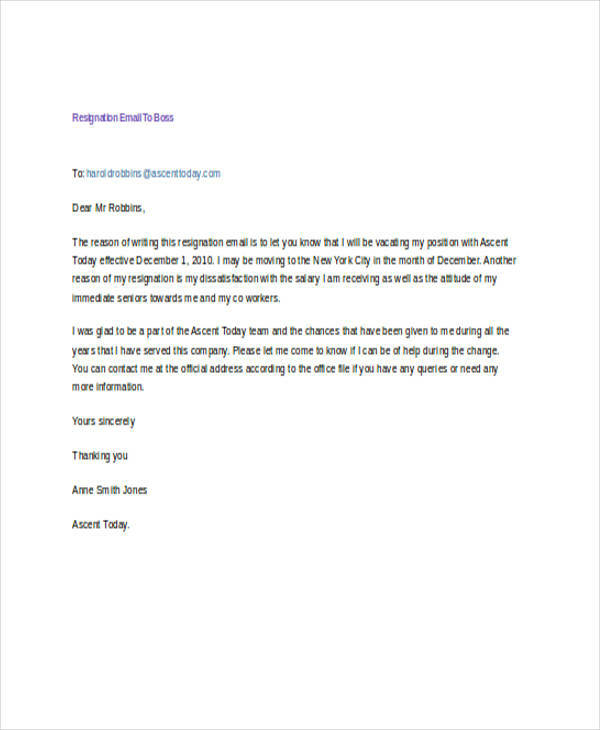 This requires you to resign by sending email messages instead. 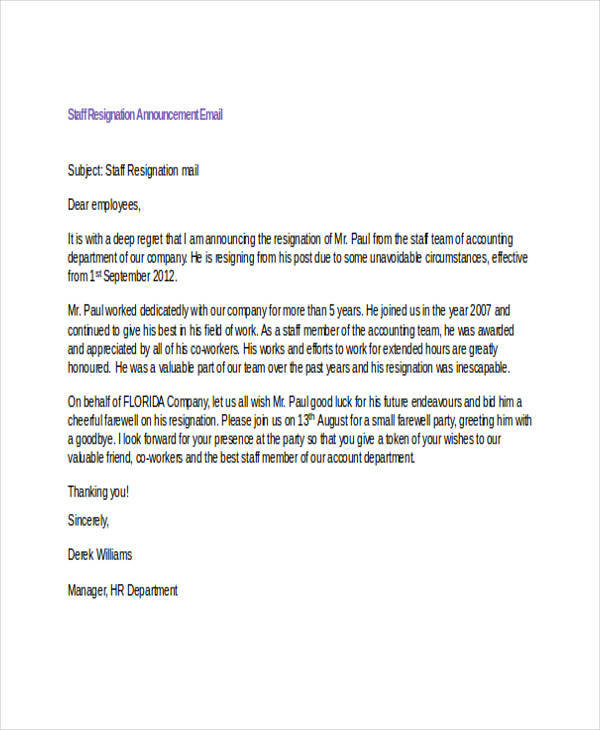 Resignation emails are usually sent using a business email (if any). Business emails are basically the ones you use specifically for business transactions. 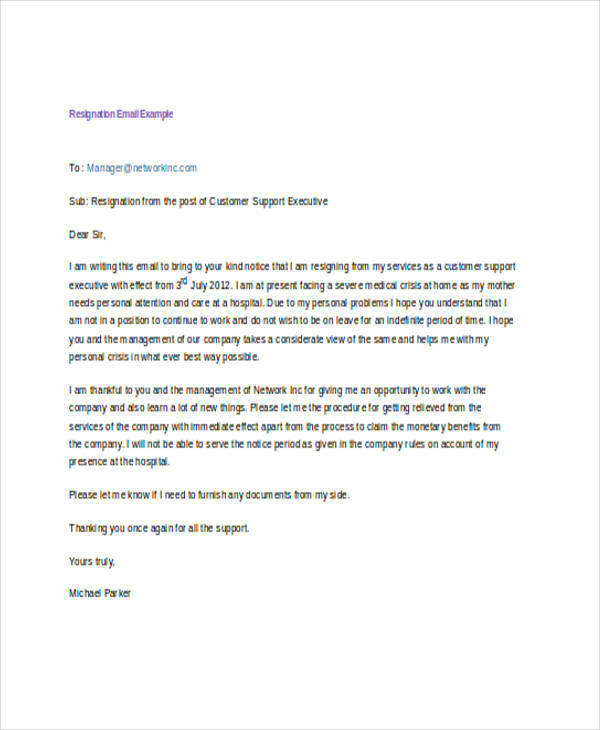 Usually, business emails are the ones given to you by your company, usually containing yours and your company’s name. 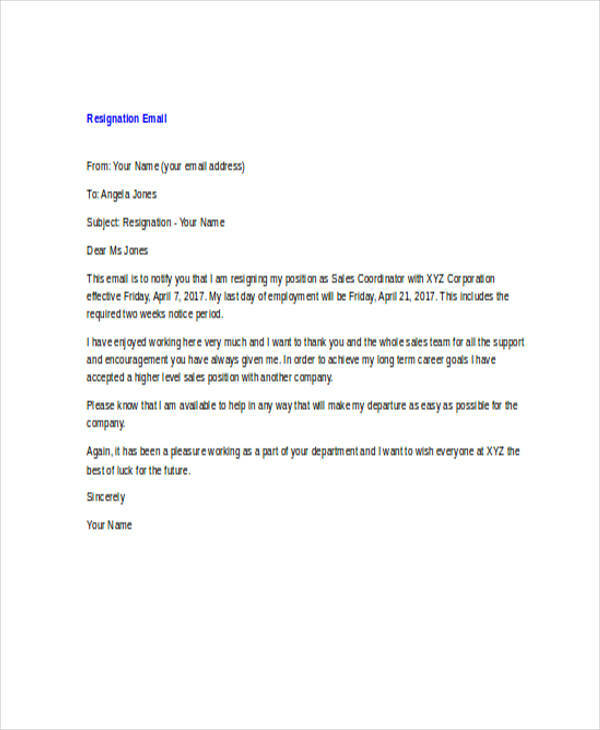 You are writing a resignation email for the first time and you find yourself staring at a blank piece of paper or word document. For starters, organize your thoughts. Before writing, jot down the things you want to include in your letter. As much as possible, be honest and stay positive. Do not complain about the things you don’t like about your company—you are not writing a complaint email. Make sure to leave a great last impression to your employers and co-workers. 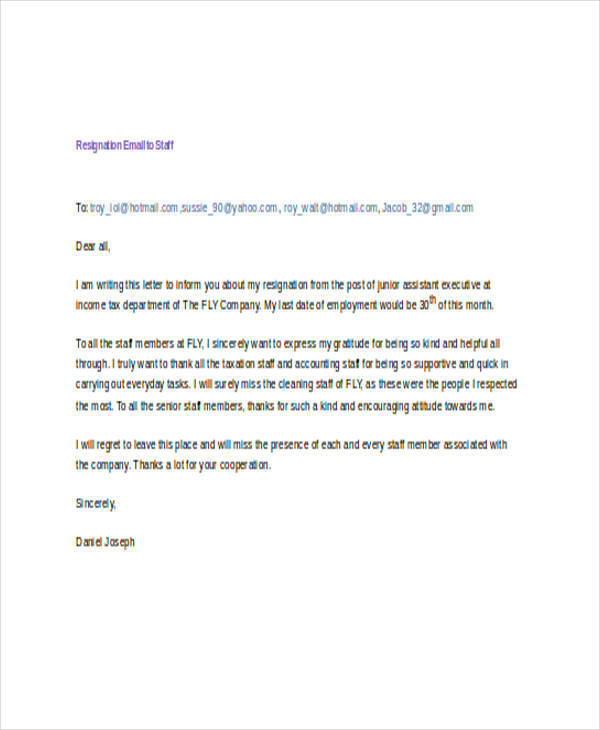 Also, it is best to send your email two weeks (or depending on what is stated in your contract) before your planned resignation date. 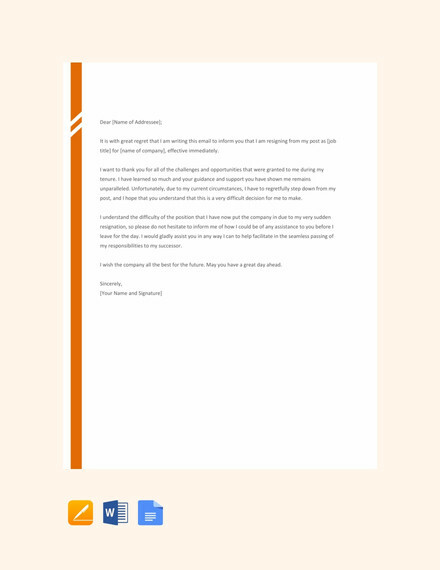 Everyone would want his/her letter to be viewed and read right away. 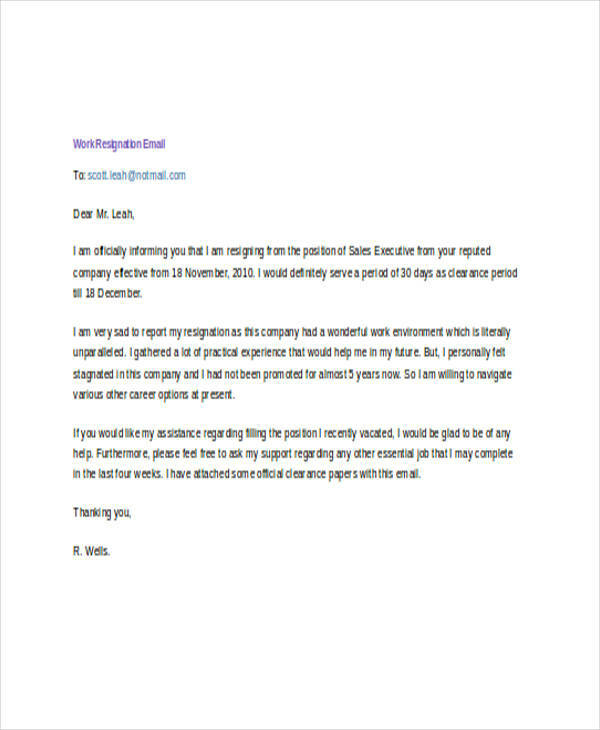 This is also the case in writing a formal email notice, especially if you are in a really big hurry to leave your job. In doing so, you would need a strong subject line that officially says “I want to resign” to your boss. Here are a few examples. 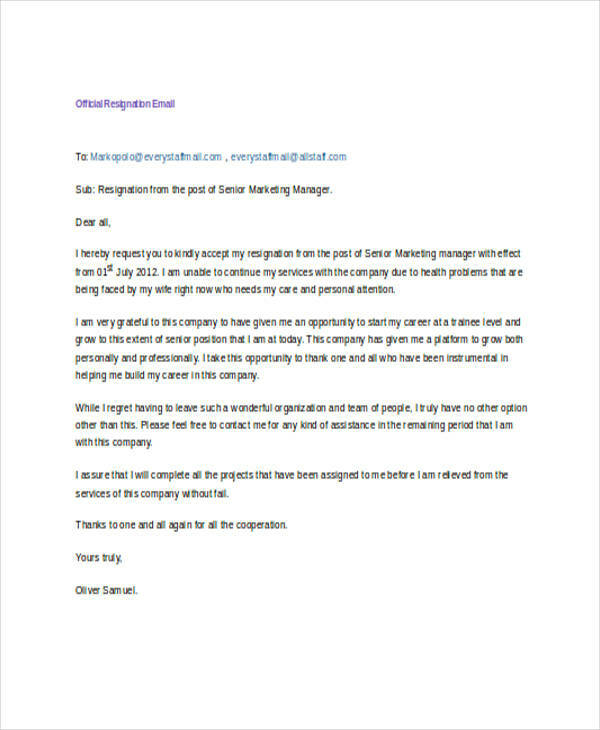 People find it hard to write a email resignation letter especially if it is the first time they are writing it. 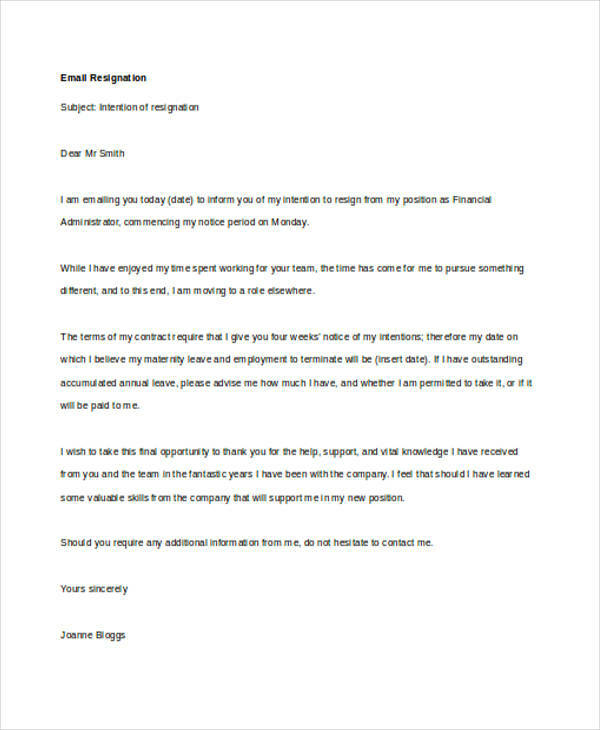 You might find resigning from a job really frustrating and writing your way out of it even more so. Finding the right words to write is quite difficult and you might find it easier to talk to your boss in person. But there are certain circumstances that do not allow you to do so. In this case, you may be required to write a resignation email. 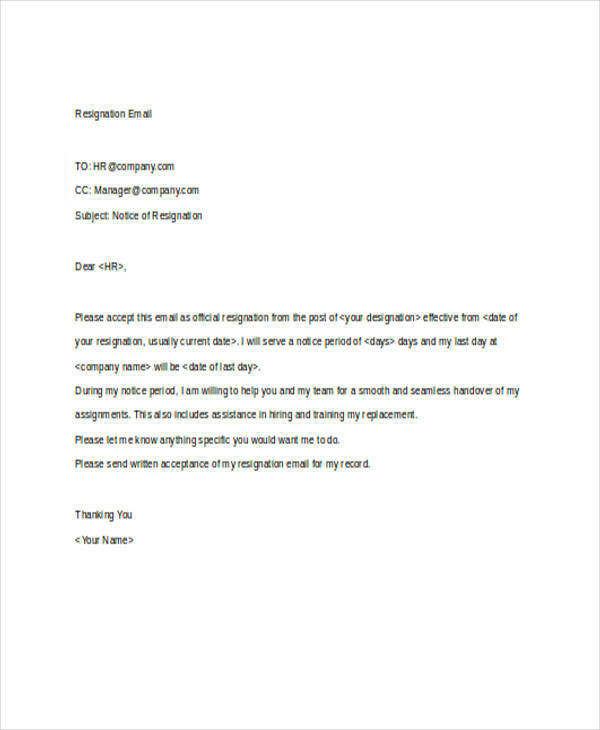 Here are the things you need to include in your resignation email. 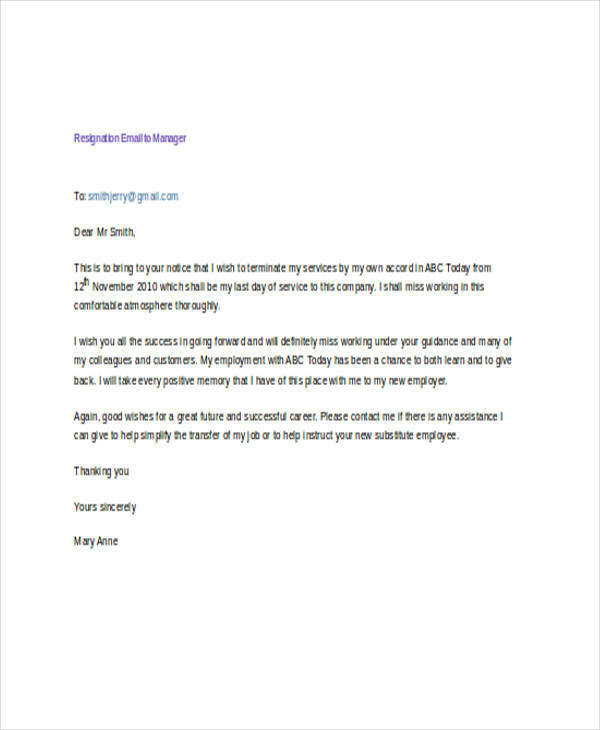 The name of your boss or the person you are addressing the letter to. A filled subject line to inform the reader what the letter is all about. Your name, and the department and position you are currently assigned to. A formal greeting (e.g. Dear [name of your boss], or Dear Sir/Ma’am, or Dear HR Department Head). 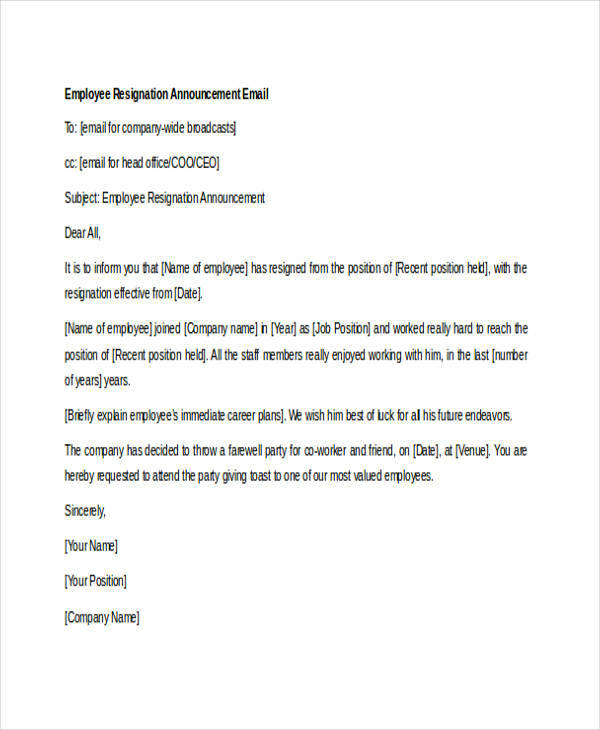 Information about your resignation (i.e. the reason of your resignation, your regret for leaving the position, etc.). A clear and concise explanation would suffice. 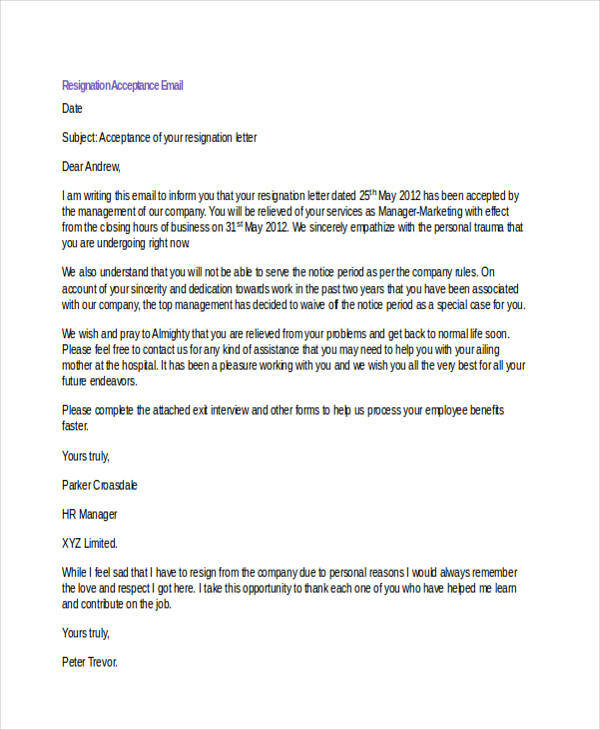 The date your resignation becomes effective and the date of your last day of work. 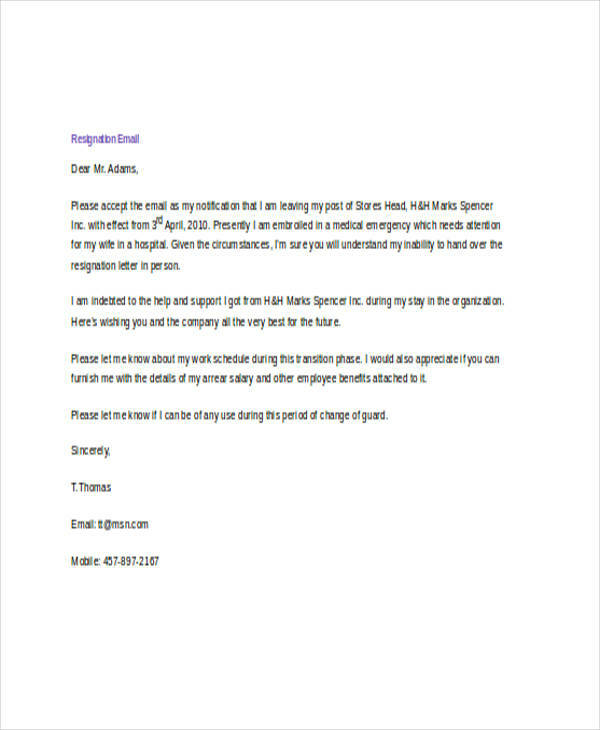 A quick thank you email message to express your gratitude toward your boss and the whole company. A formal closing (e.g. Sincerely, or Respectfully yours). 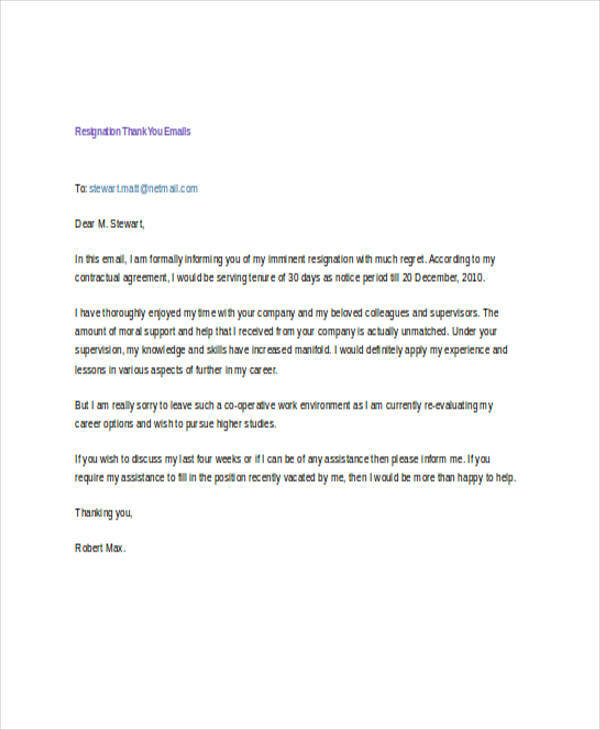 Your name and signature along with your contact information. 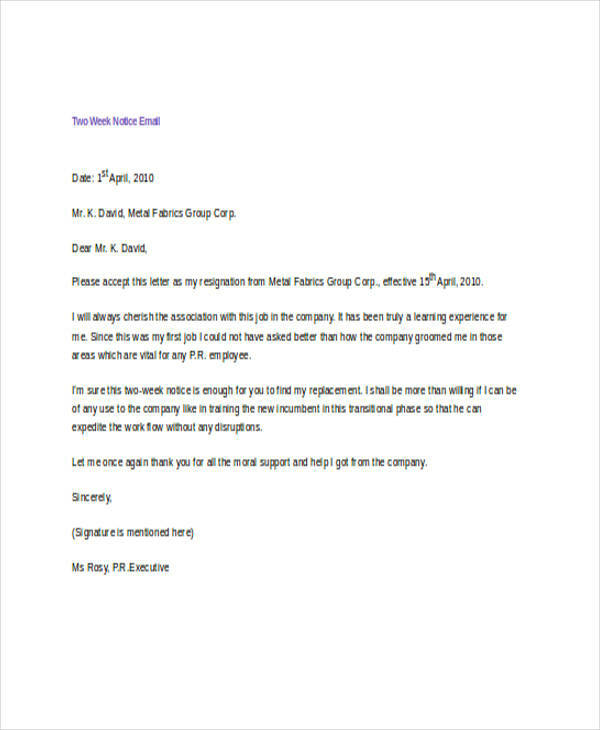 Always remember that you should write your resignation letter in a formal and professional email tone.You can also include positive remarks about the company but as much as possible, do not write negative comments about them. If your reason in leaving is another job opportunity, you can use euphemisms (e.g. explore new opportunities). And try to sound positive at all times. 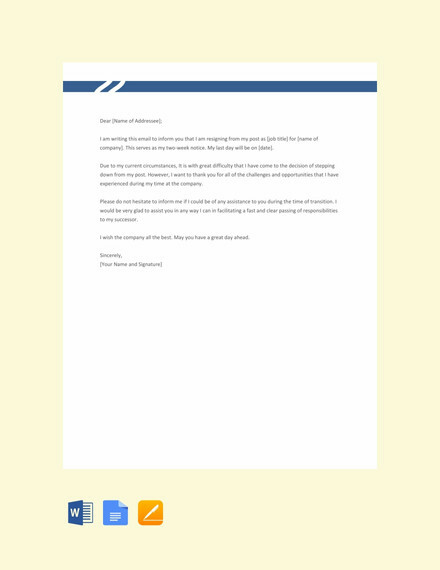 Email signatures are usually seen at the end of the email, usually containing your name, address, and contact details. 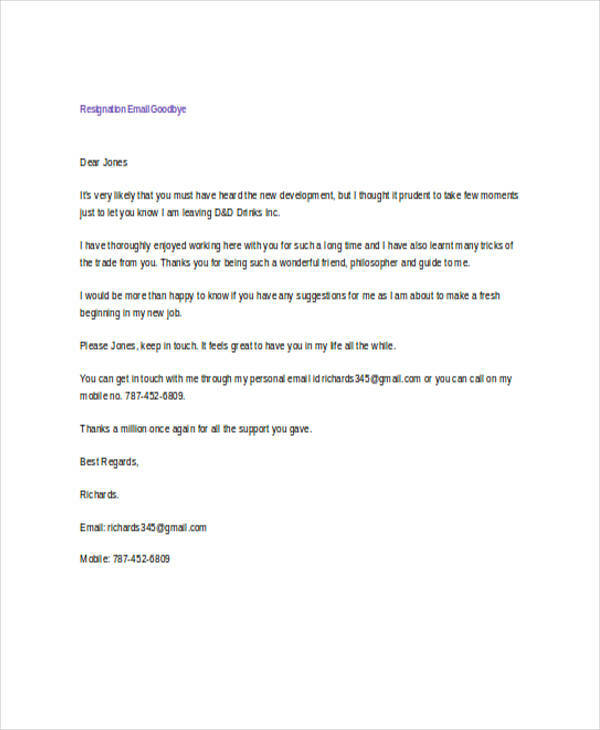 No one wants end his/her resignation email with something weak and no one wants to risk writing something which may lead to his/her employer to send a rejection email instead of an email of approval. 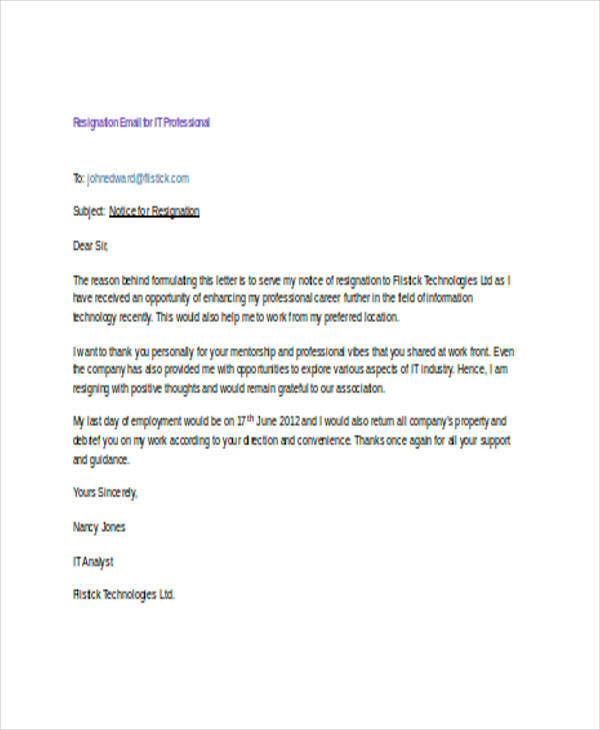 We have already tackled the basics in writing resignation notice letters so it’s time to talk about what must and what must not be done in writing resignation email signatures. 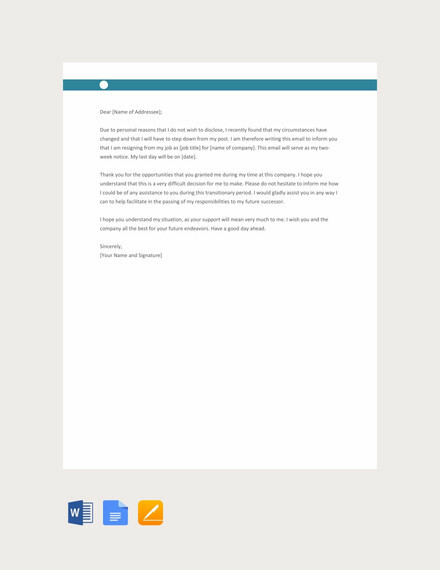 Email signatures should be written with the same font as the body of the letter and everything else. 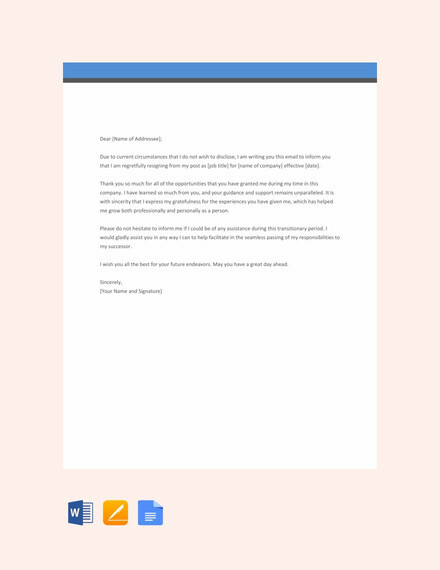 Keep your email in pdf simple and concise (maybe three to four lines). Write your contact information (address and phone number) and other important details about you. Write in fonts which may make your signature look informal. Overdo it. 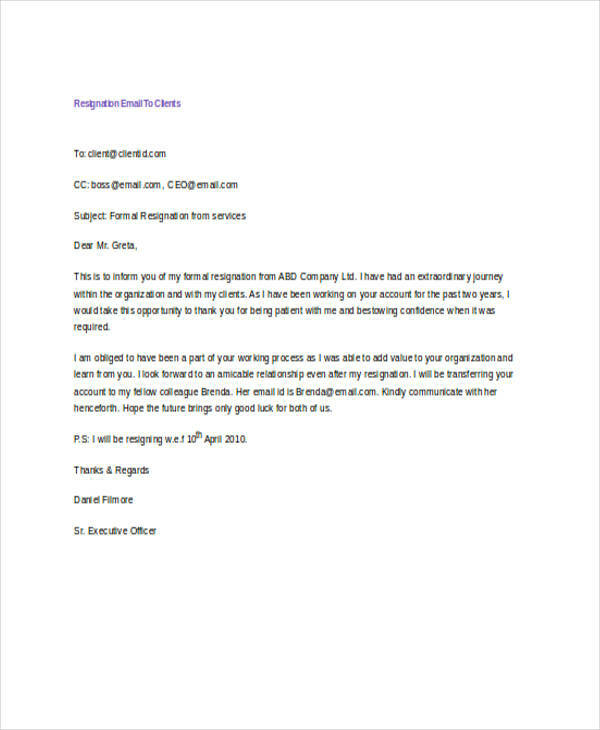 You want to write something impact and leave a good impression to your client email, do it. But not too much. Settle for less. Still, do not forget to put the important details. Overthink. We all know where overthinking leads us, so avoid it as much as you can.